You’re ready to update your home, add new life to those floors, make your kitchen pop with a backsplash or create an inviting space with an accent wall. We get it! New projects are fun, challenging and totally worth the investment. We want to help you get materials and installation for your home, at prices no one can beat! Plan on taking advantage of the deep discounts at the annual H.J. Martin and Son Warehouse Sale from 8 a.m.-1 p.m., April 28th! The sale is located at 1598 Western Avenue, Green Bay, behind our main building off of Military Avenue. We are the experts in flooring installation, so let us completely equip you to be successful during the sale! Here are our most frequently asked questions and tips from our team about how to navigate the Warehouse Sale, ensuring you get the best deals and that you completely love what you’re bringing home! Materials for Sale: We have a number of items for sale, including carpet & vinyl remnants as low as $19.00/roll, ceramic & porcelain tile starting at $.49/sq. ft., luxury vinyl products under $2.00/sq. ft., hardwood flooring starting at $.99/sq. ft., roll goods, carpet & vinyl as low as $.49/sq. ft. We also have carpet tile and carpet pad for sale. All in-stock material will be subject to availability upon checkout. All sales are final. Photos: Take photos of the rooms you are looking to add products to, specifically if they have doorways, fireplaces or anything that would affect the flooring, backsplash or area you are buying material for. Measure: Having measurements of the space you are installing is essential. A simple way to get a rough measurement for a room is to determine the room’s length and width with a measuring tape. Multiplying the length by the width will help to find your square footage. If you are constructing a new home, bring in your building plans, with all of the room measurements. If you are planning on having H.J. Martin and Son install your materials, you can schedule a FREE measure prior to the sale, lowering the risk that you will not buy too much or too little material. Matching Woodwork: If you are looking to match your existing woodwork, it is super helpful to bring a small piece of trim to the sale, to ensure it coordinates. Dye Lots: Dye lots may vary on material for certain products. Materials should be dry sorted prior to installation. Come Early: Get in line early! We have had individuals arrive as early as 6 a.m. for the sale. 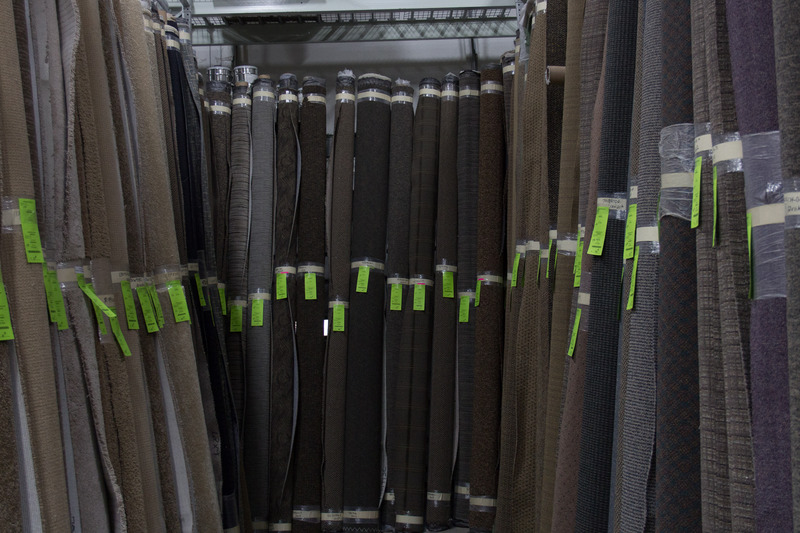 Material Sales: Carpeting usually goes the quickest, so if you’re considering more than one product, go to the carpet area early. All products are usually highly sought after, so have a plan on what you most want to take home and claim the product as soon as you can. 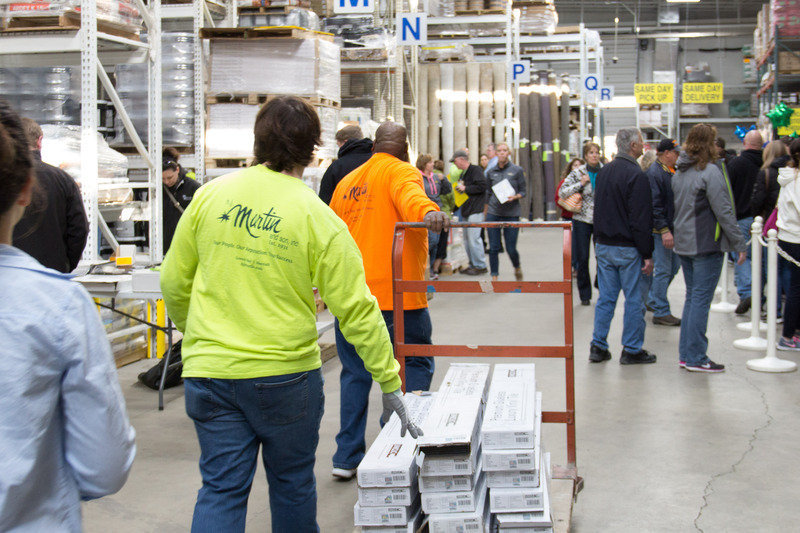 Navigating the Warehouse: The morning of the Warehouse Sale, everyone in line will be given a packet of information, including a map of where material types are located in the warehouse. Assistance: There will be H.J. Martin and Son team members wearing yellow shirts throughout the Warehouse the day of the sale, and they will be happy to help you with any questions or concerns you might have. If you have questions before the sale, call 920-494-3461. How to Claim and Purchase Material: All tile and other hard surface materials in the warehouse will have tickets located in white boxes on top of them. Tickets for carpet and other roll goods are attached to the rolls. To claim material, you take the number of tickets to correspond with the amount of space you are going to fill. Each ticket will dictate how much material is associated with it. For example, if a ticket says 10 square feet, and you need 30 square feet, you would take three tickets if there is enough material. Once you have your tickets, you can enter into the checkout line in the Warehouse. (If buying carpet pad, see item below.) Material tickets can only be checked out in the Warehouse, not in the main store. Once tickets for an item are all gone, that material is sold out, even if it is still sitting in the Warehouse. All sales are final. Reserving Material: You cannot reserve material before or during the Warehouse Sale. If you take more tickets for a material than you need, make sure to give your extra tickets to an H.J. Martin and Son employee to put back. Carpet Pad: If you are buying carpet during the sale, we will also have carpet pad available to buy to go with your carpet purchase. Be sure to visit the carpet pad area indicated on your map to order what you need before you enter the check out line. Floorcare: If you have any questions about cleaning and maintenance of your new purchase, or if you are looking to have your current flooring cleaned, we will have a Floorcare team member on site for you to talk to. Look for the banner and table near the carpet! Costs: The prices listed on our materials are the LOWEST you will see, so all prices are non-negotiable and all sales are final. 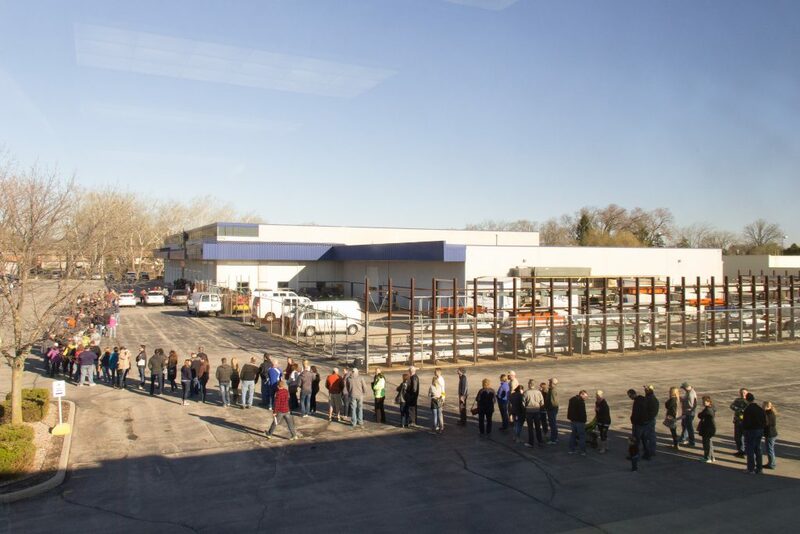 Delivery/Loading Lines: For ease of delivery and loading materials, please do not get in line for delivery and loading until after you have purchased all of your material and have received a loading ticket. Getting in line for delivery early will not hold a space in line if you do not have a ticket. Take Home/Delivery: There are two options for getting your materials home: drive it home yourself or have H.J. Martin and Son deliver it. Our team will help you load your materials into your vehicle (trucks and vehicles with trailers are best.) If you do not take it home right away, please come back and load your materials up before 12:30 p.m. the day of the Warehouse Sale. H.J. Martin and Son will deliver the day of the sale for free up to 30 miles from our Green Bay store. Deliveries will be scheduled up until 12:30 p.m. Defective Material: Customers are encouraged to inspect material before purchase and at time of loading/delivery. Defective product may be exchanged, prior to installation. Defective material return requests will only be accepted until May 31st of the current year. Broken tile returns will not be accepted after the customer has taken possession. Hardwood, laminate, and luxury vinyl tile should be kept in climate controlled area prior to installation. Claims for damaged material due to incorrect storage and handling will not be accepted. Material that has been cut or installed is not returnable. Excess and Not Enough Material: When purchasing material, keep in mind that excess material cannot be returned. Also, if you don’t buy enough, buying more will be at regular cost and can be potentially discontinued. If you have more questions or need more details, please visit www.hjmartinwarehousesale.com. We also have buying guides for you to read at http://www.hjmartin.com/residential/what-we-do/flooring-tile/. If you have further questions, please call 920-494-3461.